and a Cow Dog to work beside me. You may be asking yourself why old red barns would be a blessing? There are actually many reasons I call our barns a blessing...the ranch was established in 1890 by my husband's many time great grandfather and the barns were built in the style of the times with a hay mow in the top, and bunks and stalls below that you could toss hay down to through trap doors. Those hay mows are pretty antiquated as we don't bale small square bales today. We use only a big round baler and each bale can weigh from 1,000 to 2,000 pounds. There is no way to put them into the barn's mow, and it is unused space. But we have converted these beautiful old barns into overhead grain storage, and years ago, we cut open a large doorway in the barn above so we could drive a tractor in the large storage space to put a few bales of hay for storage out of the weather. Also, in one of the barns, we have converted an old grain storage room into calving stalls for heifers. Sometimes when our cattle are calving, a snowstorm may hit and we need space to put the cattle who may be either just calved, or due shortly. This is an excellent use of the old red barn. 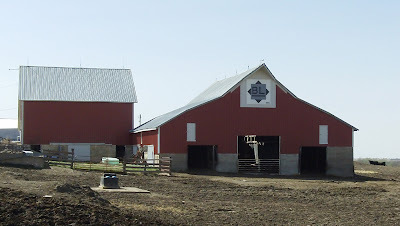 Over the last few years, we have worked to renovate the barns, adding colored tin to the sides and replacing old rotted structure boards, so we can have these barns for many more years to come. To me, these old barns signify longevity, strength, and relevance. I hope that I can be as useful as they are as I age! I love old barns, I grew up on a dairy farm in Ohio and we had a big red barn with stalls, milking parlor and all the other things barns have. I now live in Florida and we don't see old barns like in the north.